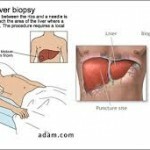 A liver biopsy is a medical procedure where a very thin needle is inserted to collect a sample of the tissue. It is a test used to determine a number of disease and disorders. Once the tissue is collected it is examined in the lab. Often this test is given when someone has abnormal liver blood tests, yellowing of the skin, and unexplained enlargement of the liver. Often whens a patient havs a liver biopsy there are certain procedures he will advise them to follow. Tell the doctor if you have any medical conditions that might be affected by the procedure. Don’t take aspirin or pain killers unless advised to do so. Tell the doctor about any blood thinning medications. Before the biopsy lab tests will be performed. Most likely these test will be blood test. It will measure your blood count, the platelet count, and how the blood clots in the body. During the procedure, the patient usually wears a hospital gown. The patient lies on a table sometimes a ultrasound is used to find the location of the liver. The doctor numbs a section of the stomach with a local anesthetic. Doctors makes a small incision in the stomach. A needle is inserted into this incision to gather a sample of the tissue for analysis. The procedure takes about five minutes. Usually the patients has to stay in a recovery room for four hours to be observed. Sometimes pain medication are prescribed when needed. Do not drive or exercise at least eight hours after the procedure. The doctor will often discuss the result with you several days later. 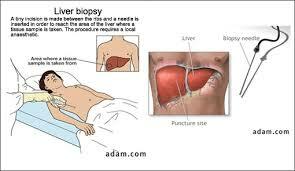 Other methods used for a liver biopsy are fluoroscopic and transvenous methods.